Discover a relaxing assisted living community tucked in a country valley amid sweeping vistas of the American West. Rising Mountains offers attractive apartment homes and just the right amount of assistance. We are close to the cultural activities and healthcare facilities of Bigfork and within 15 miles of a top-rated hospital in Kalispell. Where the old west blends effortlessly with modern city life, and the spectacular scenery changes with each season. Once you experience the peaceful environment and unsurpassed panoramic view at Rising Mountains you’ll know you are home. Monday's : Our "Beauty Shop" with Millisa is open on Mondays. Stop by the front desk and make an appointment. Friday's : "Suzette's Sparkly Salon" is open for business from 8:AM to 11:AM. Our very own executive director, Suzette, loves to pamper our residents, and has created this time just for you, and it is FREE! So, make sure you get signed up at the front desk. Friday's : Devotionals with Pastor Chuck at 2:30 PM in the activities room. March 8th: Annual Indoor Garage Sale (from 10:00 to 11:00) in Columbia Falls. March 14th: Tour and Tea at the Hockaday Museum! March 19th: Music at Snappy's Sports Senter in Kalispell! "Our mom, Ruthie, who by the way was never called that by her family, but I loved that familiarity by those who loved and interacted with her daily did just that. Muttener was a gift dancer, artist and friend! We always knew Dad was her compass and soul mate. 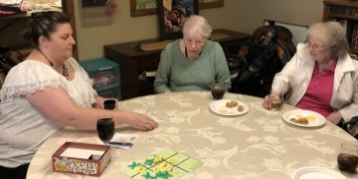 But...Rising Mountains gave her the most amazing awareness of her own self worth and joyfulness that she shared with staff, resident neighbors, and forever friends! She would only and always wish you and yours a Merry Christmas. Moms journey started on July 24, 2017. She came for a family reunion, little did we know she would have a major surgery twelve days later. September 23rd was the first day of being with her forever family. Mom called Rising Mountains her neighborhood. She have never lived by herself in 89 years, but soon she realized she was not alone. She always felt safe, loved, and that she mattered. She made friends with some of the most amazing residents. The staff were so sweet, professional, and caring. My mom felt like she lived in a five star hotel. She had never been pampered so much. Mom always loved oil painting. Her one dream was to learn how to watercolor. She looked forward to the activities like painting, crafts, and exercise classes, to name a few. It was wonderful to go with mom on some of her excursions with Rising Mountains. She loved going to Bibler Gardens and getting pedicures. I would have to plan my visits around her social calendar. "Never, ever, come on Bingo days", she said, winning quarters was a serious business. My family and I would join mom for parties, boy can Rising Mountains put on a great party! The food is the best around. I have never seen such menus in my life. Mom was convinced they were cooking all of her favorite foods, just for her. I can not say enough about the staff. They were and are family to the residents and family members. These people love their jobs and it shows! They make you feel like it isn't a job. They helped your loved ones because they are all a family. We would all laugh and we would cry together. When mom started to fail in her health I was blown away by their love and support for her and our family. Mom would say over and over again how much she loved it there. That is a huge relief for family members trying to find a home for their loved ones. I will never be able to repay my forever family.